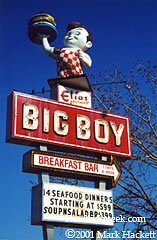 The White Grill still lights up the roadside, advertising its food and shakes to motorist passing by this local landmark. The McDonald's at Holt Summit sports one of the original golden arches, including Speedee on top. Though McDonald's has embarked on a new image for its newest restaurants in the last couple of years, there's nothing better than an original. See others here at Roadside Peek's Southern California Food Chains. Hungry enough to eat a gorilla? Well... hungry enough to eat like a gorilla? 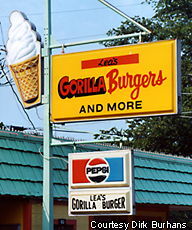 Then Leo's Gorilla Burgers of Gravois Mills, MO is that .. and more. Not sure how much more... just more. Hungry for a good beefburger? If you're in the Chicago area, check out Harl's Grill and their beefburgers and malts. 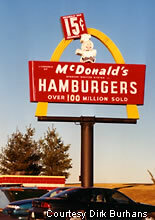 Over in the Muncie, Indiana area is an original McDonald's Hamburgers sign. Although the building itself ain't much to look at, the familiar single arches may make a stop in Muncie worthwhile. 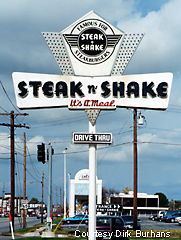 In Springfield, MO is the location of one of the original Steak n' Shake restaurants. 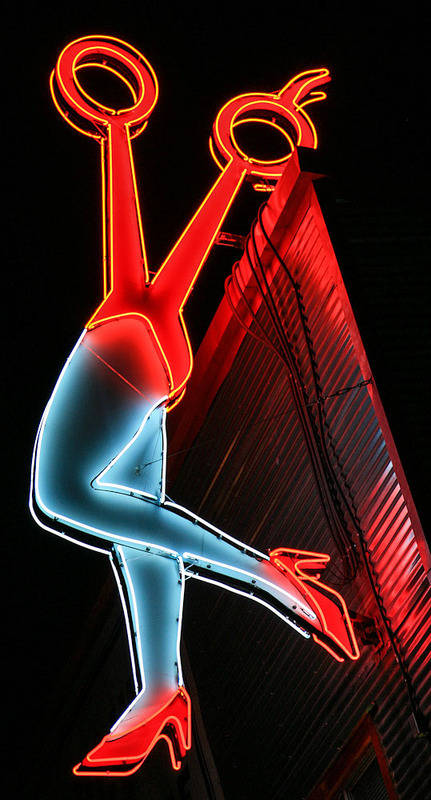 This Route 66 landmark, which also looks stupendous at night, is a good place for grub while wearing out during a road trip. Steak n' Shake was built in 1962 and is the only Steak n' Shake in the country still offering curb service. Here's a White Castle Hamburger stand, a familiar sight on the East Coast. You can buy bags of mini-burgers here which make great midnight snacks!